Yeah.... not very impressive but a starting point. I was lucky enough to have the wife agree to buying the 20l BM. 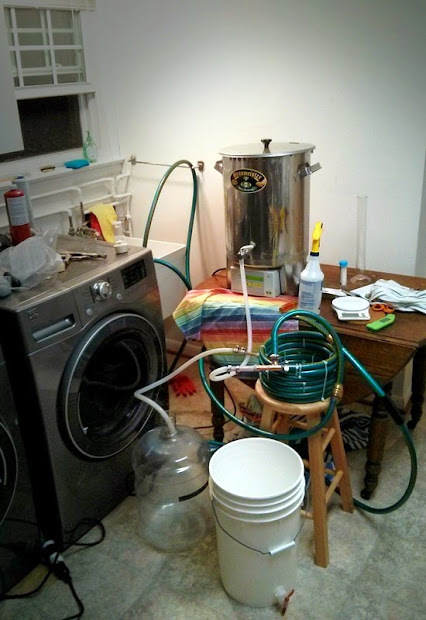 Home build counterflow chiller, arbofab Hop filter, carbon filter H2O, and pure O2 to jump start those yeasties. Keezer is being built next weekend! I'll have to Google the Arbofab hop filter as I have no idea what that is. cpa4ny turned me on to these guys. It's a 300 Micron stainless steel filter. Just brewed an IPA with it last week with 5oz of hops, and it worked like a charm. 5 australians of hops??? crikey! B&S - nice set-up, got all the essentials covered. Good for you, nice setup! And I have almost exactly the same counter flow chiller! Works like a charm doesn't it! Good idea, I 'll have to try switching the inlet and outlet next time. It was my first homebrew DIY project, and it came out pretty well. I didnt solder the connections so I have to use loads of silicon sealant to keep it from leaking. Other than that, it works like a charm! you could also try the type of fittings you can just tighten with a bolt... or invest in a small burner because you can just solder this with normal solder the beer pipe would not come into contact with the solder points.